If you’ve ever considered giving fishing a try, mark June 19th -21st in your calendar. 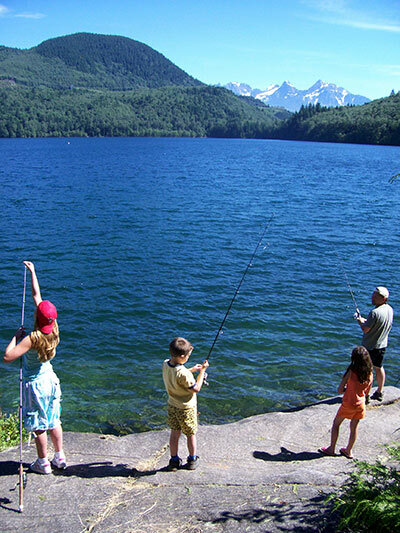 Father’s Day weekend is also the 16th annual BC Family Fishing Weekend, when BC residents can fish licence-free in many of the Province’s fresh and tidal waters. Close to fifty community fishing events will take place over the weekend, including free learn-to-fish sessions for beginners and loner rods and tackle. “These events offer a great opportunity to learn about how to fish in a fun and supported environment,” Michele Dusterhoft, President of the Family Fishing Society of BC. “The hundreds of volunteers who organize and participate in these events are passionate about fishing and about sharing their love of the sport with kids and families. They are keen to share what makes fishing such a great pastime.” The Family Fishing Society estimates that 25,000 British Columbians participate in Family Fishing Weekend each year, with approximately 17,000 of them attending one of the community events. Funding for the events comes from a number of sources, including grants from the Habitat Conservation Trust Foundation (HCTF), Pacific Salmon Foundation and the Freshwater Fisheries Society of BC. HCTF CEO Brian Springinotic says the Foundation supports Family Fishing Weekend because the events connect people to angling and the outdoors – a connection that may ultimately lead to increased conservation of fish and their habitats. “People care most about the things they know,” says Springinotic. “One of the ways people can increase their knowledge of the local environment is to head out to a natural setting with their families and fish. It’s about responsible use, sustainable use, and stewardship of the resource.” A complete list of event locations and descriptions can be found at www.bcfamilyfishing.com, and you can view a map of event locations here. For information on fishing regulations, visit http://www.env.gov.bc.ca/fw/fish/regulations/ (freshwater) and http://www.pac.dfo-mpo.gc.ca/fm-gp/rec/index-eng.html (tidal/saltwater).